I did it – I opened my book shop! Well, not the kind where you can buy books to read, but the kind where you can buy books to fill with your own poetry, scribbles, thoughts, secrets, etc. My little shop will have my beaded journals for now but I plan to fill it up with journals in different sizes and with different bindings in weeks/months to come so I hope you’ll visit often. I will let you know when a new batch of journals shows up and I plan to have a newsletter and other kinds of things but again, I’ll keep you posted on all of that. All of this feels a bit scary, thrilling and fun. I want to say a special thank you to Christine (she’s already even written about me!) and Shadan. These wonderful girlfriends have given me so much encouragement in my new venture. I also want to thank all of you readers who’ve read my posts on my projects and my bookbinding adventures. I enjoy sharing those stories. 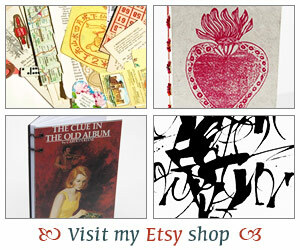 I know I’m joining a lot of other wonderful bookbinders on Etsy. There is some amazing talent on that site but I believe that will also inspire me to continue to hone my craft. Finally, a big thank you to my wonderful husband who took pictures, encouraged me and inspires me. So off I go to spend the evening with some good books and maybe I’ll even dream up some new journals for the shop. good job! They are so pretty! You are so talented. Yay! Congrats! I’ll be sure to post about this on my blog as well. God get ’em, Iliana! Now that is too neat~! Congratulations, Iliana! That is so cool. You make such gorgeous journals…your store will be a great success for sure! Fantastic Iliana!!! I’m adding you as a favorite shop right now! I’m so glad you’re doing this, congratulations! I’m so happy you’ve done this!! I have been thinking all along what a great idea it would be and you shouldn’t capitalize (in a good way of course) on your talent. I can’t wait to get my hands on one of them….I am due for a new reading journal to keep track of the books I’ve read! Wow. Wow! Congratulations on your new venture, your books are beautiful. Congratulations! This is so fantastic. You know I was thinking just the other day that I would send you an email and ask you about making a journal I could give as a gift to a friend. Now you have a store! Yippy! Congrats on your online store. Will keep checking back as I have a particular obsession with journals. How wonderful, Iliana! You should be very proud. I wish you luck in your new business venture. I will definitely be stopping in now and then! Good luck with it, and I look forward to seeing your new journals as you make them. I’ve already bookmarked your shop! YAY – you are officially announced. I am so happy for you and I, of course, love the journal I purchased !! Looking forward to seeing more and more in your new shop! Beautiful Witch – Ah well, journals from Italy are quite special 🙂 When you use those up come on over… I do love to use Italian papers! Jessica – Thank you for checking them out! aka Nik – You are a sweetie – thank you bunches! Les in NE – Didn’t my husband do a good job? Hope he won’t mind that he’s become my official photographer – ha,ha. Danielle – I’ve been thinking of doing this for months and really with the help of my friend Shadan who put in a big order for me back in April I thought you know, why not! So here it goes! Tara – Thank you so much!! Rhiona – So glad you stopped by. I have an obsession with journals too. Even though I can make my own I’m still always buying new journals! ha,ha.. Literary Feline – I’m feeling happy but it’s a bit surreal too! I never thought I’d be doing something like this back when I first started bookbinding but let’s see where this goes! tanabata – I think my husband was too! ha,ha… Now one of these days I will do some bookbinding with Japanese papers. Gorgeous stuff but a bit pricey! As soon as it gets cooler, I am going to a couple of stores in New Orleans to ask the owners to buy your journals. Very cool! Congrats. What a great site. I don’t have a PayPal account so I’ll have to wait awhile, but I will be purchasing one of journals. They are beautiful. Good luck. Congrats! I’ve got you bookmarked and will definitely be picking a few journals up as Christmas gifts! Hey — that’s awesome! Congrats on the new store; it looks great. Best of luck with it — it sounds like a lot of fun. Beautiful work, and I’ve been wanting to buy more via Etsy, so I’m glad you have joined. Wishing you great success and lots of FUN! Ruth – Aw, thank you! Hopefully I’ll have some more cool new journals just in time for holiday shopping! Dorothy W. – Thank you so much. I’ve been toying with this for several months now and finally taking the big plunge! I’m behind here and catching up but congratulations, iliana!! That’s just wonderful news and so very enterprising of you! You make truly beautiful things and I wish you every possible success. Oh btw who made your fabulous banner? I already have my eye on some things! I’m sorry I’m so late in seeing this and congratulating you!! These are so cute, I just have to decide which one I want! !